When former military police officer Seth Froom became the victim of an armed robbery it prompted him to create one of the most interesting iPhone cases to hit the market to date. This case, known as the Yellow Jacket, not only offers protection for your phone, it also has the potential to protect your personal safety and well-being thanks to its built-in 650 kV stun gun. Froom actually had a stun gun and firearms in his house on the night he was attacked. However, all he had within reach when the armed robber entered his home was his cellphone. The stun gun he owned was designed – for the means of easy concealment – to look like a cellphone. After his ordeal, he looked from the stun gun to the phone case and an idea was born. Froom took his creation to crowd funding site Indiegogo and has now raised more than $85K of US$100,000 goal and plans to go into production. 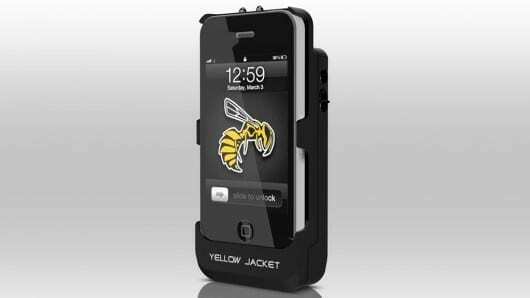 The Yellow Jacket features its own built-in battery which provides the juice necessary to fend off any would-be attacker. The battery also acts as a backup for the iPhone, granting up to 20-hours of additional standby time. Safety was a major concern for founders Seth Froom and Sean Simone. With this in mind, they implemented two layers of protection to prevent users from accidentally shocking themselves while trying to make a phone call; a safety switch that must be engaged before the device is capable of stunning and an electrode cap designed to prevent accidental physical contact. The creators also had to think about how quickly someone under attack would be able to pull the device out and use it on an assailant. It only takes a couple of seconds to flip back the electrode cap and hit the safety switch. When compared to the time it would take for someone to reach into their bag and pull out pepper spray or a standalone stun gun, this could be the difference between life and death.